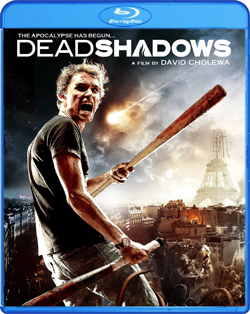 (Release Date: April 29, 2014)  "Dead Shadows" was fully developed and financed by first-time director David Cholewa, an important distinction to be aware of as this apocalyptic zombie/creature-feature hybrid plays out. The CG effects are rough around the edges but certainly competent for such a low-budget effort, while some blatant continuity errors and its undernourished script by Vincent Julé give it a homegrown feel despite its loftier aspirations. The outcome is easy to give kudos to, but the film as a whole misses the mark, the story too inadequately explored to come off as more than a derivative variation on everything from Lamberto Bava's "Demons" to Danny Boyle's "28 Days Later." When he was a child, Chris (Fabian Wolfrom) watched his father go insane and attack his mother on the same night Halley's comet passed overhead. Ten years later, he must face his lingering fear of the dark when another comet approaches, cutting off the electricity and mutating much of the population into psychopaths and out-of-control monsters. As he attempts to make his way back to a party where the girl he likes, flirtatious artist Claire (Blandine Marmigère), is in danger, Chris is pit against a world around him that is fast coming unglued. What powers does the comet have? What are the motives of the many-tentacled interlopers? Why are some people instantly affected, while others are not? Director David Cholewa doesn't concern himself with answering these questions, but does take pleasure in some goopy scenes of face-melting and a rather ghastly, otherworldly sexual assault. Imagery is the film's high point, from a rather awe-inspiring prologue set in outer space to a set-piece involving a woman who has partially turned into an eight-legged arachnid, but what is between these moments meanders in the face of a paper-slim plot and feet-dragging fight choreography. At 76 minutes, "Dead Shadows" still feels a bit stretched beyond its means and concludes with little of the tragic grandeur it is aiming for. There is certainly worthwhile stuff within, but when it comes to self-made sci-fi projects shot on a shoestring, Gareth Edwards' 2010 dazzler "Monsters" is an impressive notch above. Perhaps the worst thing that can be said about the 1080p transfer of "Dead Shadows" is that it sometimes looks so clear that the seams of the lower-tier visual effects start to show. On the other hand, there is also a softness and lack of fine detail to certain scenes that doesn't quite match what one expects from a new motion picture premiering on Blu-ray. Its downfalls are probably due to the digital source material's low budget, but it warrants mentioning. Certainly, it still looks superior to what standard-def DVD could ever hope to provide. Four audio tracks are includedFrench and English 5.1 DTS-HD Master Audio and 2.0 DTS-HD Master Audio formats, respectivelybut the only choice should be the French-language lossless 5.1 version with (if necessary) English subtitles. The film sounds great, with the active mix featuring potent soundtrack cues, an effective instrumental score, and dialogue that is reliably even and clear. The English-language tracks serve only to call attention to how artificial audio dubs can be. If you are watching a French horror movie called "Dead Shadows," you should hopefully be old enough and capable enough to read the occasional subtitle on the screen. As Scream Factory continues to branch out into newer genre acquisitions, something like "Dead Shadows" that is neither a home run nor a disaster flourishes by receiving a level of care and promotional availability that it otherwise might not have gotten. Filmmaker David Cholewa's passion for this project is in evidence from beginning to end, and that is consistently preferable to an uninspired work-for-hire product that doesn't have anything to offer besides more of the same. Perhaps a rental of "Dead Shadows" is in order before a full-blown Blu-ray purchase, but please continue to support Scream Factory regardless. No matter what the picture is they are putting out, they can be relied upon to meet the same high standards in quality they have been setting for themselves since they burst onto the high-definition home entertainment scene in 2012.